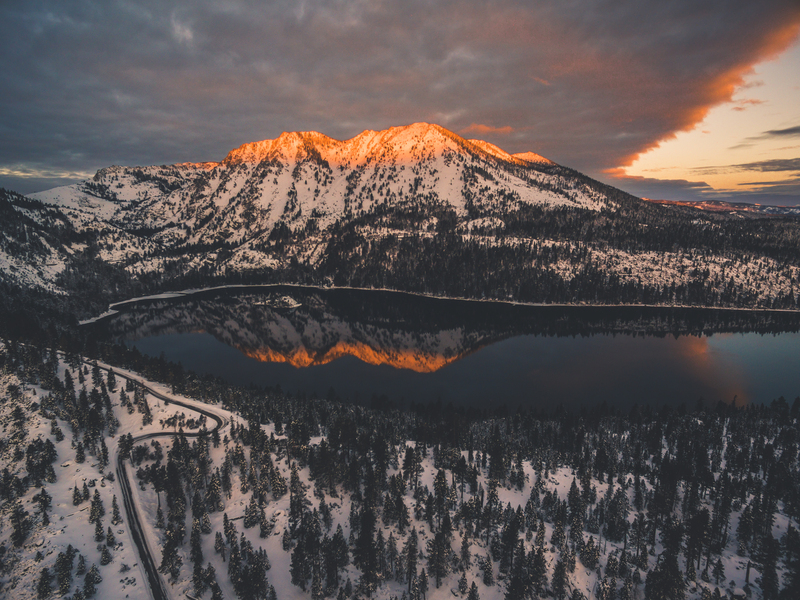 Fresh from his North Lake Tahoe Instagram takeover, we caught up with Davey Hibler, a Reno photographer and videographer known for his drone footage, sunrise photography and landscape shots. Two years ago Hibler got his start taking time lapse sunrise shots on his GoPro during morning shifts at FedEx. First, breaking into the wedding industry, then moving into portrait and landscape photography, Hibler has grown an Instagram following of more than 11,000. With his Phantom 3 drone at his side, Hibler traverses California, Northern Nevada and Mexico, capturing his unique take on stunning landscapes. I woke up for the sunrise. Drove up and got to Tahoe around 5:30 in the morning – sunrises there are around 5:45. I headed to the scenic outlook, right before you get to Incline Village. I got there and it was hazy because of smoke from several fires that had been in the area. Fog and haze are some of my favorite things to photograph; you can just barely see the transparency of things. It gives it its own look, and it’s definitely an in-the-moment kind of thing. Right after that, I went down to Speedboat Beach, that’s my little beach I like to go to. It’s kind of hidden. All of the big rocks there are very photogenic. I flew my drone there for a little while and caught the rest of the sunrise. I used to always go by myself for sunrise or sunset. There was this one time when I was at Donner by myself with a layer of fog. That was the first time I had brought my drone there. You couldn’t see the sky at all, it was just clouds. I flew my drone right over the clouds, and you could see the sun was up and it was amazing. It’s a feeling you don’t get with anything else. It’s very unique and it’s something I try to strive for – those moments. You can’t plan for them, they just happen. 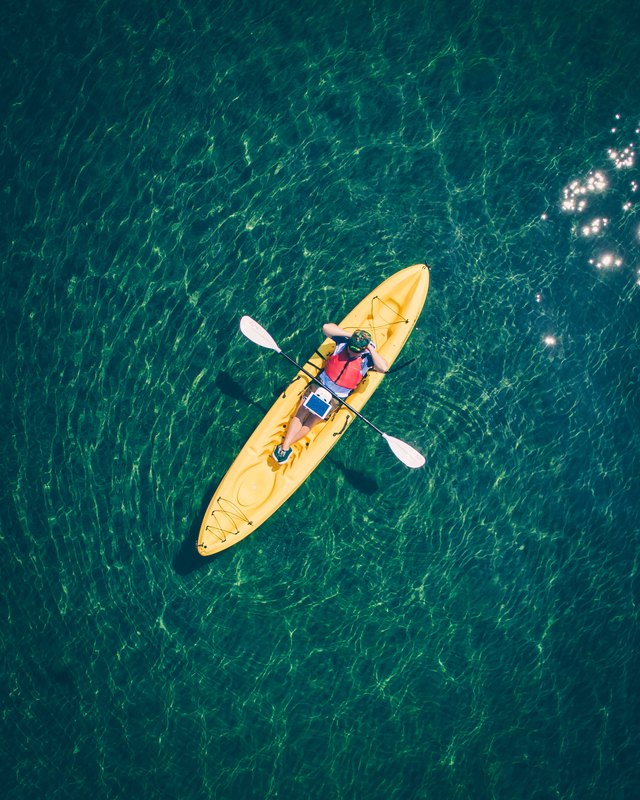 During the takeover I had an appointment to grab a kayak with Tahoe Adventure Company. Initially when I was going there, there were no clouds. The cool thing, is with all of the smoke and haziness, they brought out a ton of colors from the sun. Typically Tahoe is calm in the morning, and true to its form, there was no wind that day. I planned to bring my drone, camera and GoPro out in the kayak. That was difficult because the kayak was small and personalized, but the suitcase the drone fits in is rather big. I ended up paddling back to the shore to set the drone up, then took my controller out and flew the drone out from there. With drones, it’s very cinematic, and that’s the style that I really strive for – smooth pans and long shots that are very straight and establish the setting to tell a story. Shooting mid-day can be difficult; you have to find shade, or certain types of shade to soften the light. But the cool thing about the drone, is even during the middle of the day, you can really get away with shooting great footage. In the evening the first day of my takeover, I went to Incline Village. 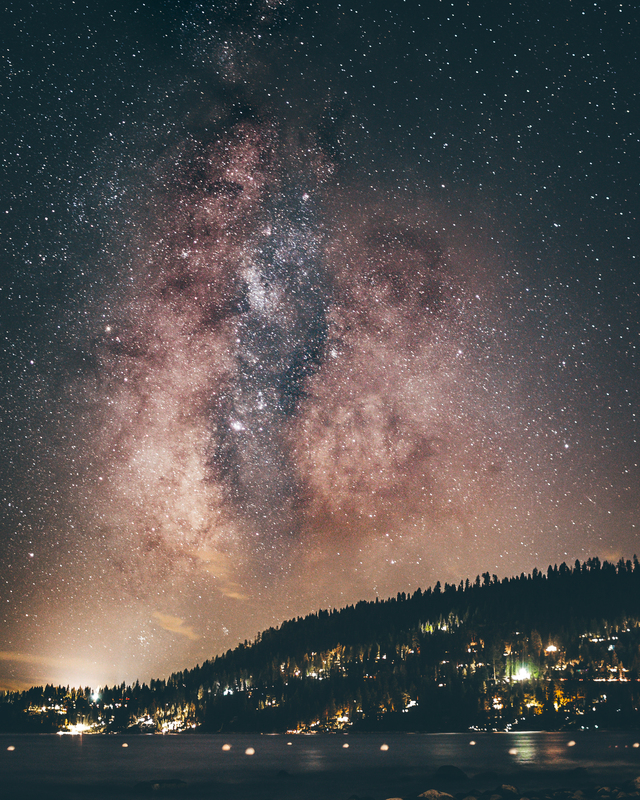 The cool thing about Incline Village is during Milky Way season, it’s always there within that area. If you’re in North Lake, it’s very picturesque. A lot of people don’t really see the Milky Way. It’s another thing that’s always there, but you have to look for it. During the summer months is when I usually capture my best Milky Way shots, because it’s up nearly all night. Usually I’ll set up in the late evening, and wait until two hours after twilight fads. For taking dark light photos, it’s all about the gear you have. There are a lot of factors that come into it. If the lense you have is a little tight, then you start seeing the stars moving, because the earth is rotating. To get it pinpoint sharp, there are a lot of things you change with the ISO and the aperture and the different shutter speeds. ISO Setting: the best ISO for clarity is less than 3200 – this is the last thing you want to touch, because it increases the sensitivity of the sensor. Some of my favorite shots happen around North Lake Tahoe. Chimney Beach and Speedboat Beach have iconic landmarks that are photogenic year-round. Lupines peak at Lake Forest Beach in June; I’ve seen a lot of really spectacular wildflower photography come from that. 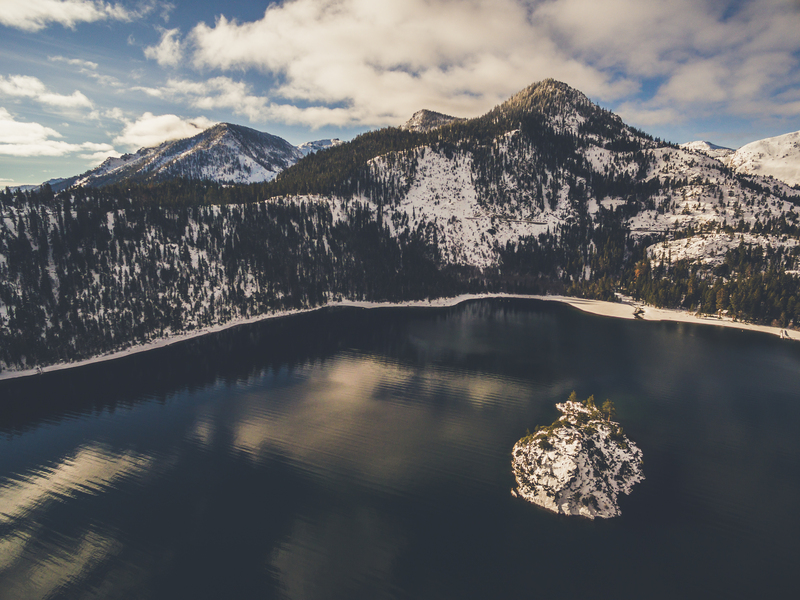 Emerald Bay is probably my absolute favorite. I feel like a lot of times I go there because of the little mountain range right behind there. It reminds me of the massive mountains in Yosemite. Also the little island out there fascinates me so much. For the longest time I’ve wanted to kayak out there and do a time lapse. One of my favorite pictures I took there was right when the sun was rising and the mountain was cut in half by the light. I might prefer shooting the between seasons. They’re great because the days are a lot shorter and the sun isn’t too harsh. The lighting is a lot better. For capturing people, the autumn colors are ideal for a great portrait. During my takeover, I shared a time lapse video at Bonsai Rock from this past winter. There was fog that morning, and no other clouds. The contrasted created one of my favorite photos I’ve ever taken. Accomplished photographers takeover the North Lake Tahoe on a monthly basis. To see more stunning imagery, follow North Lake Tahoe on Instagram @tahoenorth. To see more of Davey Hibler’s photography, visit http://www.daveyhiblerproductions.com/. 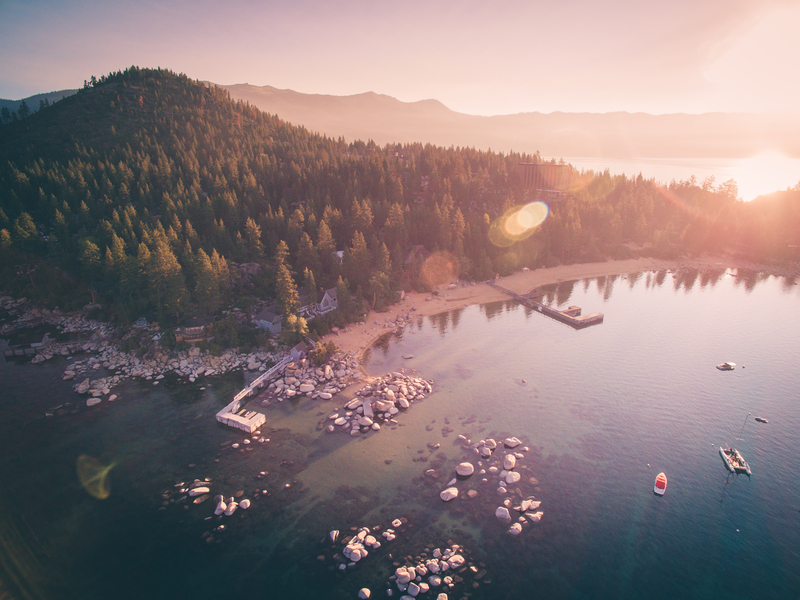 The post Behind the Scenes of an Instagram Takeover: Capturing North Tahoe with Guest Photographer Davey Hibler appeared first on Go Tahoe North.